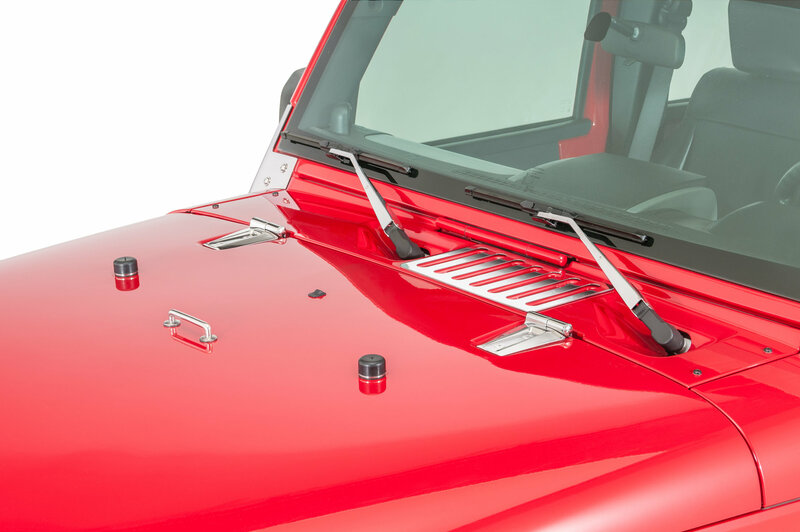 Kentrol's Stainless Steel 4-Piece Hood Kit for the Jeep JK is designed to replace the stock hood hinges, hood vent, footman loop, and tie downs while providing superior quality. Kentrol Stainless accessories are Salt Spray tested which helps to determine any material flaws during production assuring the finest fit and finish possible. This hood kit comes complete with all hardware needed for installation. An occasional waxing will keep your polished finish looking brand new. All Kentrol products are tested, inspected and built to last a lifetime and are backed by a lifetime warranty. Available in Polished Stainless, Powder Coated Black, and Textured Black finishes. Not all stainless steel accessories are created equal. Kentrol begins with mirror finish 304 and 410 stainless steel sheets and tubing that simply will not rust. Utilizing their own proprietary tooling and engineered drawings, Kentrol's Stainless Accessories are then stamped, drilled, machined, welded and polished to achieve the finest fit and finish possible. Kentrol uses thicker raw materials compared to the competition and always includes high quality stainless steel mounting hardware. Kentrol delivers consistent quality and innovation and the finest stainless steel accessories for your money.